UTS recently announced that we have entered a 12-year Power Purchase Agreement (PPA) with the 32 MW Walgett Solar Farm, to be developed by Epuron, kick-starting a brand new solar energy project in regional NSW. This is a significant increase to our investment in solar energy, which will see the university purchase the equivalent of half of our annual electricity needs from this sustainable source. UTS has chosen this path because we are serious about sustainability. The good news is that it also makes sound financial sense. The PPA is the outcome of a 12-month process that involved preparation of a business case, an open competitive process, negotiations with the preferred bidder and sign-off all internal and external approvals. We believe it has set a precedent for how large institutions can use their purchasing power to kick-start new solar projects. I would like to share some insights from our approach, and highlight the benefits of such a strategy, to encourage others to explore where they can make this kind of impact. Early in this process, we understood that solar farm development takes time. Projects like the Walgett Solar Farm can take years to be realised, with the various approval processes and land- holding agreements required. Rather than investigating building our own solar farm, UTS opted to receive bids from ‘shovel-ready’ projects – projects that were already a number of steps through the planning process. This allowed the early development works to be left to developers with specific expertise, while enabling UTS to start receiving the benefits from the solar generation much sooner. An advantage of a large and highly capitalised organisation like a university is our credit worthiness. 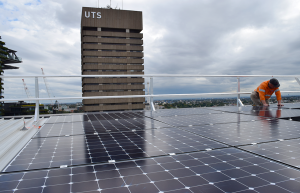 It would not be difficult for UTS to attract a low-cost loan if we decided to invest in and own a solar farm. Interestingly, PPAs are structured in such a way that our credit worthiness can be used by the solar farm project to attract similarly attractive project finance. For solar project developers, this can help to overcome a key challenge of raising capital to fund construction. Developments in solar technology have substantially brought down the cost of solar generation, which in turn has made solar PPAs increasingly commercially viable. A commitment of this scale just would not have been viable for UTS even three years ago, when solar farms were around double the cost per MWh. The large-scale and largely automated manufacture of solar panels has seen extraordinary reductions in price over the past decade. At the same time, solar panels have become more efficient. Single Axis tracking – technology that rotates solar panels to align with the path of the sun, allowing greater generation over the year, including at high-value times in the morning and late afternoon – is now only a marginal additional cost compared to fixed panels. The current energy mix in NSW makes our state perfectly placed for expanding solar generation. NSW imports 10% of its electricity over the year, with peaks of up to 25% during times of high demand, so there is plenty of room for increasing local generation. Our grid has existing flexibility through hydro power and pumped hydro, which can complement solar generation ability. Even our existing gas power stations and black coal power stations are flexible and can adjust as incoming solar power increases. NSW sources only 5% of its electricity through solar at the moment, well behind the likes of Queensland (9%) and South Australia (11%). Peak demand in NSW is driven by air-conditioning and aligns with peak solar hours. With Liddell Power Station due to close in three years’ time, more generation is needed to continue to meet demand. A key challenge for solar farm investment is the variable nature of revenues and the potential for lower prices in the future. This is known as market risk. By signing a PPA, UTS takes on some of this market risk. But this is not a new risk to UTS. As a large electricity customer, our electricity costs change over time as the electricity price changes. Buying power from new solar and wind farms for a contracted price is very attractive to large electricity users. By agreeing to a fixed price for the power generated, solar projects achieve more consistent revenue, assisting them with meeting loan payments. For the purchaser – in this case, UTS – it provides a more balanced overall electricity cost. If the wholesale electricity price decreases over the medium and long term, revenues paid to UTS under the PPA will decrease but this will be balanced by the reduction in the cost of our own electricity consumption. If prices increase, UTS will receive higher payments under the PPA, offsetting our exposure to future high prices for our own electricity use. There are more than 17,700MW of proposed solar and wind projects in NSW going through various stages of early development. Finding suitable counter parties for PPAs is crucial to enabling more solar power to be financed and built. It is a bright time for corporate sustainability. With new solutions emerging, we can play our part to support a reduction in emissions for NSW and Australia. And this can be done while helping budgets and the bottom line. We are proud of our achievement in securing the PPA and supporting the new Walgett Solar Farm, and look forward to its construction followed by clean, efficient solar power generation in 2019.